Autoimmune disorders—chronic diseases—have become a way of life for children and young adults, yet the cause is not being addressed. Here is clear and strong evidence that the cause is the massive number of vaccinations. A PLoS study has documented that, given enough vaccine injections, everyone will develop an autoimmune disorder. The study was performed on mice developed for their ability to withstand such chronic disease. It found that the immune systems of all these autoimmune disease-resistant mice become deranged by the time they’re given an eighth injection of antigens alone. That is, injection of adjuvants was not required to cause autoimmunity. Antigen injection alone was enough to cause autoimmune diseases. Combine that information with the massive increase in autoimmune disorders in humans over the last couple of decades and we have a smoking gun pointing directly at the massive number of vaccinations routinely given to children. What more is needed to demonstrate that routinely injecting people is not an acceptable way to engender disease immunity? Such immunity has long been known to be far from the same quality as naturally-obtained protection. Unlike natural immunity, it’s far less effective, resulting in many who have been vaccinated to succumb to chronic disease. What immunity that is provided doesn’t last a lifetime, as does occur with most childhood diseases. For this limited protection, we can now see that there’s a virtually 100% surety that nearly everyone will suffer from chronic diseases, such as diabetes, multiple sclerosis, lupus, inflammatory bowel disease (IBD), allergies, autism, and now even new diseases, such as macrophagic myofasciitis (MMF). Where’s the sense in that? Even if vaccines were completely effective, how can inducing autoimmune disease in most people be justified? The study in question, called “Self-Organized Criticality Theory of Autoimmunity”, found that overstimulationof a particular type of T-cell results in the development of autoantibodies. These are antibodies that attack the self, not invaders. The immune system is turned inward. The authors set out to determine whether the integrity of the immune system is compromised by repeated injections of antigens, foreign substances that induce an immune response—in particular, the development of antibodies. Strong stimulation by an antigen, which is the goal of every vaccination, initially results in the incapacitation of T-cells. However, the T-cells recover, divide (reproduce themselves), and create antibodies. But they also start creating interleukin-2 (IL-2), which are associated with autoimmune disorders. The last item, RF reactive against galactose-deficient IgG, is typically found in human autoimmunity, and all are associated with autoimmune disorders. One point to be noted is that the research utilized the same antigen over and over. That could very well be related to the current proclivity to give the same vaccines over and over because of their inadequacy in producing adequate antibodies to prevent disease transmission. The DTaP (diphtheria, tetanus, pertussis) vaccine is scheduled to be given five times by age six! That’s three different antigens given 5 times over. That alone could easily explain the massive increase in autoimmune diseases. But then you must add in the Haemophilus influenza, pneumococcal, and poliovirus vaccines, each given 4 times; rotavirus and hepatitis B given 3 times; and meningococcal, MMR (measles, mumps, rubella), varicella, and hepatitis A given twice, and all of these given by age 6! That’s a tremendous burden on a developing immune system. And all that doesn’t even take into account the harm done by adjuvants or the annual flu vaccines! Just imagine, if parents go along with the CDC’s recommendation, their child will receive 6 flu vaccines—each with at least three different antigens—before their seventh birthday! 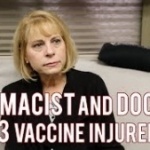 Why do our public health agencies insist on pressing all these vaccinations? Why are there no studies to determine the effects of the full schedule of vaccinations? Why are there no studies to determine the effects of multiple antigens in single vaccines? Why are we even losing our right to refuse? It’s obvious that public health agencies have something other than our health at the forefront of their deliberations. It’s equally obvious, with the revolving door between agency employees and Big Pharma/Agribusiness, that far too many employees in the most responsible positions are beholden to the companies they’re supposed to regulate. Agencies like the FDA, CDC, NIH, EPA, and USDA do not exist to protect the public. They exist as little more than marketing fronts for Big Pharma and Agribusiness. The role of interleukin 2 in autoimmunity.